The Barossa Valley was settled in the 1840-50's by German immigrants escaping religious and political persecution. German Mr Lemke, who around 1912 came to the Barossa Valley to distribute Adventist literature, related well to the locals. In 1915 the German Seventh-day Adventist Church of Greenock was formed and met in homes each Sabbath until a church building was found. Soon after the church become known as the Nuriootpa Seventh-day Adventist Church. The church, previously a workshop, was located on land donated by Mr A. Bartsch where it is still located today. Services were in German and by 1927 were still conducted in German once a quarter. Church records were also kept in German until Jan 7, 1917 when they changed to English. Mr Wilhelm Sachse was the first person baptised, by Pastor Turner, on Dec 19, 1917 in the large dam near Greenock. Baptisms were regularly held in this dam until the early 1950's. The church has wall paintings, featuring the texts John 3:16 and John 17:17, originally in German, were repainted in English in 1920's. 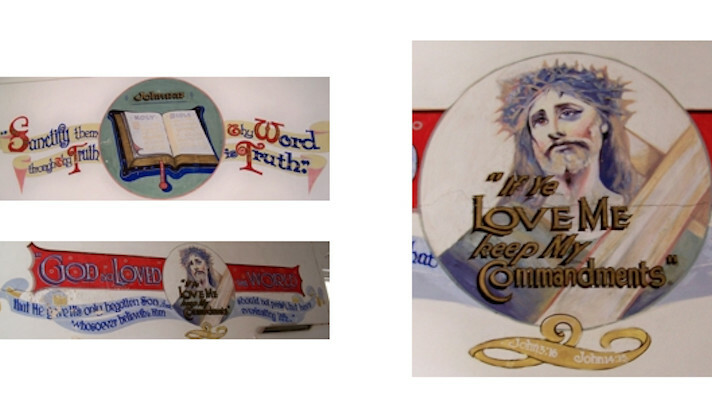 These paintings can be seen in the original church building (the church hall). Construction of a new church, in front of the old church, started in 1972, using mostly volunteer labour, it cost $26,000 to build and was opened Nov 8, 1975. In Oct 1975 the name was changed to the Barossa Valley Seventh-day Adventist church.